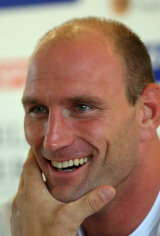 Lawrence Dallaglio became one of the most decorated and successful English players of all time. Emerging as a raw talent in the back row during England's victory at the 1993 Sevens World Cup at Murrayfield, Dallaglio went on to secure 85 England caps and cement his place as a hero of English rugby. He was educated at King's House school in Richmond and Ampleforth College before continuing his studies at Kingston University. Dallaglio was the only member of the squad to play every minute of England's 2003 World Cup-winning campaign, and alongside Richard Hill and Neil Back became part of the affectionately named "holy trinity" of back rows. With Back and Hill providing the abrasive grind and graft, Dallaglio dealt in aggressive, passionate ball-carrying and defence. His fire was complemented by superb skills from the base of the scrum and an expert eye for a destructive set-piece and during the campaign he came to personify the will to win of the squad alongside captain Martin Johnson. The victory made him one of only two players worldwide, along with Matt Dawson, to have won both the Sevens and 15s World Cups. Dallaglio was a one-club man, playing every first-class game of his career for Wasps. He took the reins as club captain in 1995 when Rob Andrew departed for Newcastle and made his England Test debut in November that year against South Africa. In 1997 Dallaglio made his first appearance in a Lions shirt during the tour to South Africa, playing in all three Tests of the successful series. He would go on to be selected for two further Lions squads in 2001 and 2005, but on both occasions had his tour ended early by injury, forcing him out of the reckoning for a Test place. Dallaglio was granted the England captaincy by Clive Woodward in the autumn of 1997, but was forced to relinquish the post in 1999 after a scandal involving allegations of drug dealing by the News of the World newspaper. Dallaglio was cleared of the allegation but fined £15,000 by the RFU for bringing the game into disrepute. The allegations were hugely damaging to Dallaglio's status as a hero to England fans, and also to the England management, whose judgement was called into question. He was eventually recalled for the Test against the USA in August 1999 and led Wasps to a second consecutive Tetley's Bitter Cup win in 2000. His second stint in charge of England came in 2004 following the retirement of Martin Johnson, but the team fared poorly in the wake of their glories of the previous year, and he announced his own retirement from international rugby in August 2004. However, following his Lions call-up in 2005 and recovery from injury, Dallaglio made himself available for England selection again at the end of that year, going on to feature in four matches of England's 2006 Six Nations campaign and scoring a try against Wales at Twickenham. Dallaglio's resurgence was completed when he led Wasps to a Heineken Cup victory against their old rivals Leicester Tigers at Twickenham. The result was all the more remarkable considering the poor form Wasps had carried throughout the season, failing to make the play-offs in the Guinness Premiership, and the fact that Leicester were going for an unprecedented treble. He was selected for the England squad to tackle the 2007 World Cup, but failed to make as dramatic an impact as in 2003. An appearance as a late replacement in his second World Cup final was to be Dallaglio's final action in an England shirt, but he was unable to stop his team slipping to defeat at the hands of South Africa. Dallaglio returned from the World Cup and immediately announced that he would retire from all rugby at the end of the 2007-08 season. He secured a fairytale send-off when in his final match he led Wasps to a Guinness Premiership final victory over Leicester, and his old sparring partner Martin Corry, at Twickenham in front of an 81,000 crowd. Dallaglio saw this victory as Wasps' greatest in the Premiership due to the damaging effect the World Cup had on the squad, with them lying near the bottom of the table at the tournament's close due to the heavy number of players that they provided to the World Cup squads of England, France and Ireland. Many see Dallaglio as the embodiment of the courageous England forward, determined and successful throughout his career at the highest level and at one point the aggressive spark for the best pack ever to wear the red rose.